Our Multi-Use Series package is designed for the flexibility that today’s producers are looking for in their smoothwall hopper bins. The all-welded, smoothwall design provides a free flowing surface for many different kinds of commodities. With no bolts or corrugations, the smoothwall hopper bin is self cleaning making it maintenance friendly. 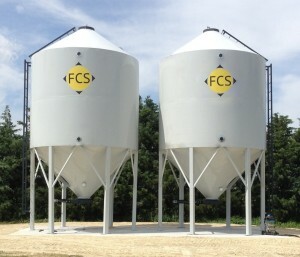 FCS Manufacturing uses high quality, minimum 10 gauge steel in all of its tanks. These strongly built Smoothwall bins will be able to stand up to high winds without collapsing or caving in the side. The hopper slope is set at 45 degrees to ensure proper clean out. Our Premium Rack and Pinion roller door on the bottom makes it easy to unload your bin, and provides years of trouble free use. The top door can be controlled from the ground, and when opened lays down flat so that it won’t be hit with an auger. All of our Multi-Purpose bins are prepped with our detailed 3 step cleaning system, and then primed and painted using a Durable Enamel paint. Add an Epoxy Liner and store Fertilizer! The Seed Bulk Series smoothwall hopper bin package is designed for seed dealers handling and treating bulk seed. Bulk seed treating facilities need storage bins to handle their seed, and they need it handled gently and kept clean and dry. The all-welded, smoothwall design provides a free flowing surface for the seed to flow against. With no bolts or corrugations, the smoothwall hopper bin is self cleaning making it maintenance friendly. It also helps keep it clean from dirt, rust and other contaminants. 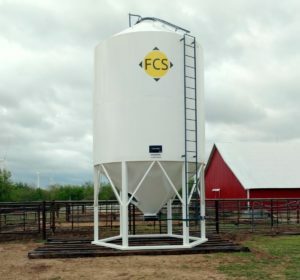 FCS Manufacturing uses high quality, minimum 10 gauge steel in all of its tanks. These strongly built Smoothwall bins will be able to stand up to high winds without collapsing or caving in the side.The hopper slope is set at 40 degrees to ensure proper clean out. Our Premium Rack and Pinion roller door on the bottom makes it easy to unload your bin, and provides years of trouble free use. The top door can be controlled from the ground, and when opened lays down flat so that it won’t be hit with an auger. When closed, the door can be tied shut so that it won’t get blown open. All of our Seed Bulk Series Smoothwall hopper bins are prepped with our detailed 3 step cleaning system, and then primed and painted using a professional 2-part Acrylic paint for a bright finish. Each bin comes standard with a seed ladder and safety features to meet OSHA’s standards.